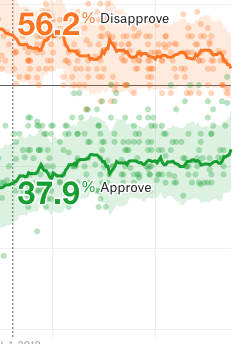 I am sure I’m not the only one who uses 538’s tracker to gauge the pulse of popular opinion on a nearly hourly basis, nor the only one who freaks the hell out when Trump gains 1/10th of a point in popularity. And I’m definitely not the only one who’s noticed that he’s up by a lot since his nadir, and given everything that’s going on, I find myself demanding answers. Things appear bad at first blush. Looking at 538’s tracker for the year (which I posted above). In January of 2018, Trump went from 37.9% approval (a point or so above his absolute low, and a net approval of -18.3), to 42.1% approval now (net -9.9): a jump in approval of 4.2%. Read literally, 42 out of every 1000 of your countrymen who once thought Trump was bad looked around at what he’s doing and saying and decided that he was a-ok after all. That’s messed up. But what is 538 (and RCP, who are definitely pushing a conservative narrative) are essentially being played by low-quality pollsters? I don’t just mean Raz, but basically all of the robo-dialers and internet pollsters. 1.1%. That is much less than 4%, and given the sampling sizes of the pollsters, totally inconsistent with the low-quality pollster trend. I’m not saying that it’s not crazy that his approval isn’t dropping daily; it clearly should be. 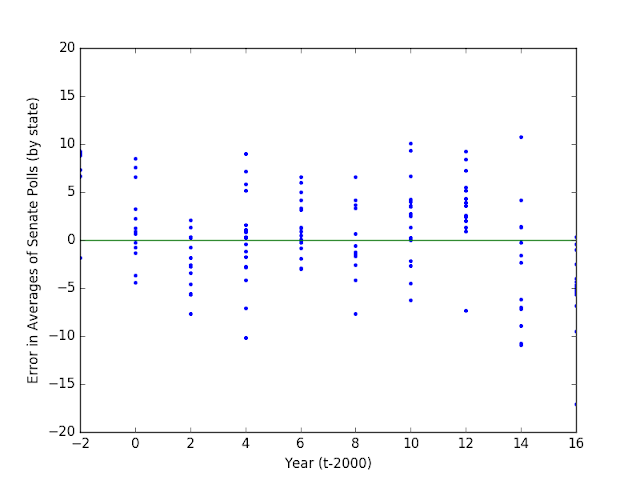 but taking a systematic average within respected pollsters produces a very different result than just averaging everybody (even with 538’s weighting and incomplete corrections) whenever cheap pollsters decide to report. My low-noise tracker. Those purple triangles, by the way, are Monmouth, whose most recent polling has really pushed the narrative in the last few days. Doing so, you find that there’s actually a hint of a re-reversal over the last month or so (though I wouldn’t bet the farm on it). The question still remains as to why low-quality pollsters (and especially the odious Raz) are seeing such a strong recent trend. This may be one of those “shy fascist” effects. But on the other hand, as I've noted, pollsters (and especially high-quality cell phone calling pollsters) have done extremely well during the specials. 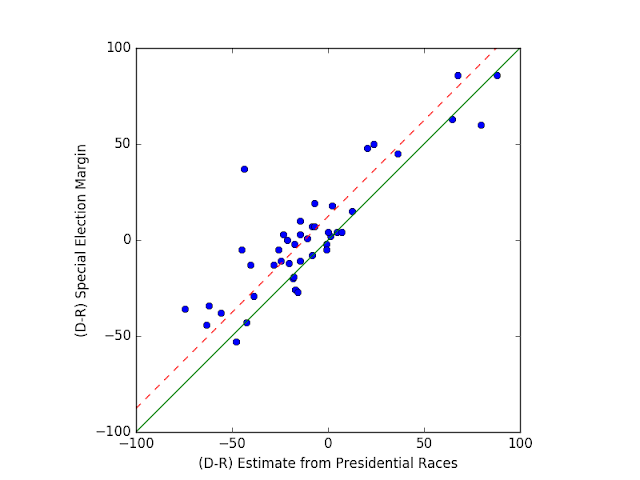 One possibility is that the trendines are being dominated instead by pollsters who insist on reweighting their samples to include fixed numbers of Republicans, and as the party slowly bleeds people willing to be associated with them, the true believers artificially inflates their numbers.